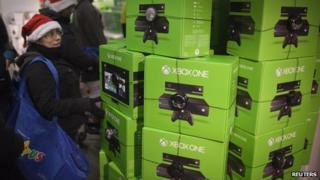 The prank message, originated on the 4Chan website, falsely claims to enable the new console to play games made for its predecessor - the XBox 360. The Xbox One cannot play those older games and those following the bogus advice could "brick" their console, rendering it inoperable. Microsoft issued a warning about the prank via social media site Twitter. "To be clear there is no way to make your Xbox One backwards compatible and performing steps to attempt this could make your console inoperable," wrote Larry Hryb, director of programming for Microsoft's Xbox Live network in a tweet. The prank originated on a forum on 4Chan - a humour and discussion site known for playing tricks and pranks on the naive and gullible. A message posted to one of its forums adapted a series of button presses, menu choices and ID details required to turn an Xbox One into a device that can be used by developers who need to test games for the console. This sequence was independently discovered earlier in December and shared via a YouTube video. Unfortunately, anyone following this advice who was not an actual Xbox game developer and who did not have a real ID would put their console into an endless start-up loop. Worse, there is no way to undo the damage once the console has been "bricked". It is not clear how many people have followed the fake advice but a message crafted to look like it was issued by Microsoft and which listed the instructions was widely shared on games forums and social media networks. Some tech news sites excerpted messages posted to the original thread on 4Chan, which suggest several people have destroyed their console this way. In the UK the console costs about £429. The discussion thread on 4Chan where the advice originated has now been deleted.